The name of this lovely beer is quite a mouthful, but a mouthful of the beer itself is worth several more paragraphs, so here we go. Hopworks Urban Brewery produces some really delicious organic beer up in Portland, Oregon, and their Organic Survival Seven-Grain Stout is made from a collection of seven different ancient grains. It's a beautiful black brew with a thin tan head and aromas of toasted grain, coffee, and some very familiar but unidentifiable aroma that sent me spinning through whimsical olfactory memories of long ago. It's a smooth, chocolaty, rich beer with strong notes of roasted coffee, dark grain, and wonder. This is a beautiful stout, and if you ever find yourself somewhere with this magnificent beer on tap, you'd be doing yourself a disservice by not having a pint or three. While wandering around Portland and sampling its many beers, I heard of a Forest Grove brewery called Off The Rail Brewing, whose beers were inspired by the music of Black Sabbath. "I am intrigued," I said to my drinking partner, Dirt Rivers, "so we shall drink their beer." And indeed, we had a couple of pints of their amber ale, Sweet Leaf. We were quite pleased. It poured from the tap a cloudy, deep amber with a thick off-white head with nice retention and thick lacing. On the nose, it had a malty sweetness. Dirt thought long and hard before declaring, "It smells like beer!" And beer it was! We thirstily consumed this very pleasant beer, which had a mellow but thick mouth feel. It was sweet, but not overpowering, and has a muted and pleasant hop note. I would certainly have this beer again, and would likewise recommend that all of you readers hunt it down, as well. A good little smoke... for someone. cedar background. Very tasty. Can edge toward the bitter end of the spectrum, but this never became annoying. The wrapper is probably Cameroon, although here I think it is mostly detectable in the fairly complex finish. A good amount of nicotine, but not too strong-- satisfying. Later in the smoke, the character changes and becomes a tad liquorice. This is an unusual note and some people will probably love it. The construction is good, a little uneven. The wrapper won't be winning any beauty contests-- more of a "certificate of participation" contestant, in the show but not in the running. My wrapper was mostly smooth with some small veins, and slightly oily. This is a light to medium bodied cigar that smoked well to the end. Robustos are just never my favorite size for some reason, but I certainly enjoyed this-- though I was happy I didn't have too many of them, as the character simply wasn't in line with my preferences. This would be an excellent smoke with a lighter cognac, good Irish whiskey, or perhaps calvados. It is priced well, but wasn't exactly my cup of tea at the end of the day. This is my second gueuze review, and I think I can happily say that I'm finally developing a taste for these odd brews. The Lindemans Cuvée René Gueuze comes from the producer of lambics perhaps most famous in Oregon, as one can find their products nearly everywhere. I went through two pours of this. The first pour was a pale, clear gold with tiny bubbles and a thin, small head. At a glance, I would have guessed it to be a pilsner. It smelled, however, like sour apples, bananas, and bread, with a dose of tartness. It was, as expected, quite tart on the tongue, with strong lemon and lime notes, more sour apple, and a pleasantly biscuity yeast. The beer was quite effervescent with a thin mouth feel. On my second pour, I made sure to swirl the beer left in the bottle to stir up the yeast and sediment, which added a golden haze to the beer and brought out sweeter citrus notes and a welcome nut character on the back of the palate. It also added quite a bit to the body. I found this to be a very drinkable gueuze, though I still believe that it would be best enjoyed as part of a meal, perhaps as an apertif or along with a strong, gamey meat. By Jove! What monster unleashed this pitiful brew upon the unsuspecting public? I cannot imagine who thought this would qualify as a drinkable beer, much less as a pale ale, which is supposed to be among the most drinkable of American craft beer styles. I managed to restrain my skepticism using a combination of ancient techniques learned from Himalayan monks and an unhealthy lust for beer, and poured this devilish brew into a glass. It certainly doesn't look bad. It appears as most pale ales do, with an innocuous clear amber hue and a modest head. I still approached it cautiously, vampire-repelling crucifix at the ready, but my caution was not enough! I was assailed by its aroma, a potent, harsh thing that was entirely too much like snorting the wrong end of a grapefruit. The hop odor blasted an unholy unpleasantness into my nostrils. My moustaches uncurled, my eyebrows melted, and my nose decided to take a holiday someplace more pleasant, like Tacoma. Yes indeed, as my co-taster put it, it ended with the questionable scent of a dirty hippie. I fought my way through the offensive effluvia and the beer eventually found its way to my tongue, where thankfully the bland flavors did no further damage to my body or soul, though my sensibilities were mighty bruised. Compared to the nose, the taste of this beer is meek and bland, with hints of hops and malt and a peculiar lack of potency and character. Overall, this is not really a good beer, and not something I'd recommend tasting. I would, however, recommend sending a six-pack to your enemies with a very friendly, happy note. It would confuse the hell out of them. Tasty! Creamy, rich cedar flavors immediately hit and never let up. A super cigar for the money! I got twenty of these in sets of five cellophane packs, and have to say that the wrapper color looks to be extremely consistent across all the packs. Good draw, though on the firm side. Medium-full bodied and rich, very solid woodsy-spicy core flavor but not much complexity. The tobacco has hardly got a hint of harshness. I find it somewhat boring-- but also more than somewhat tasty. Produced loads of creamy, delicious, throughly pleasant smoke! As it progresses, the flavor becomes somewhat more intense and leathery, but remains primarily monodimensional. I'd be disappointed if these were particularly expensive, but they aren't! They remain as they begin: pleasing, full and rich, solidly forward. What's more to be said? A good, nicely made cigar with flavors I enjoy that smokes well and is an excellent value. Quite the pleasure for the price, and a winner for me. "Some day," I told myself, "I'll have a house to keep all my stuff in." I was right. What's particularly strange to me is that when I actually start looking through my precious hoard, it doesn't generate the comfort and security I had dreamt of. I won't bore you with an inventory, let's just say that I have a tremendous amount of things that I don't need. Over time, I also have excelled at burdening myself with another category, many of which those things I don't need have become: things I don't want. The things I don't want generate worry and a tremendous psychological burden: the things I thought would root me to my home have done just that, and it has turned my house not into a personal museum dedicated to displaying my awesome array of interests and fine taste, but instead into a burdensome place that offers me only problems and limitation. Do I really need laser discs? VHS tapes? Manuals for computer operating systems I will never use again? Will I really scrapbook those old party invitations? How is it that I allowed myself to accumulate so much pure crap? Persons with far greater understanding of economics than my own have surely meditated at length on this issue. What troubles me is the specter of artificial need, and what scares me is the thought that I am the one who always has given myself permission to have such junk to begin with. I can understand how my changing tastes might contribute sometimes, but what on Earth has been so wrong with me that I let it get so bad? To participate in society, we must exchange. One fundamental reason so many goods are available is because they are so ubiquitously needed, and of course we most often purchase certain goods because the labor or expertise required to produce them exceeds our own means, or because the expense of producing them at small scale is greater than the number on the sticker-- especially when marked down. How simple it would be if when surveying my piles of junk I only saw evidence of that kind of buying: Instead, somewhere I allowed the signal to noise ratio to become very poor. I'm not really questioning whether it's okay or not to buy things, and I can't possibly comment on anyone else's perception of their possessions and their personal value. I am saying that if I had considered the burden of physically possessing my junk before I let it get so far out of my hands, I would be able to look around and say "I use that" or "I like having that", instead of being worried with where I was going to put things or how hard the junk would be to get rid of. I want my sense of freedom back. One of the Chap's hallmarks is a kind of disdain for the mass-produced. It's not that a Gentleman of Leisure avoids ever purchasing anything meant for a broad market, but that he knows that such owning such goods requires giving up some individuality-- almost by definition. It's one more handy ideological tool that can be used to evaluate whether or not something's worth having, because by the time I paid for that one gizmo and all those extra boxes to keep floppies in, I could have afforded two tickets to Shanghai after all. Good memories don't take up any extra space. I was lucky enough to get a sample of Mad River's new seasonal, which they're calling Serious Madness Black Ale. When I hear a beer described as "black", I usually think it will be similar to a German schwartzbier or a Belgian black ale like New Belgium's 1554, but this was neither. I think the closest would be some sort of heavy porter, but there seems to be a lot of confusion about this beer's categorization, so I'm not even going to try. It pours a beautiful black, showing a deep ruby when held up to the light, with a tan, frothy head that has good retention and some nice lacing. On the nose, there is primarily a smell of roast coffee, which follows through in the taste. This beer has a pleasant sweetness with perhaps some hints of a unique yeast in the finish. It doesn't present a very strong hop character, but the roasted darkness reminded me strongly of a porter, I think, or a strong stout. 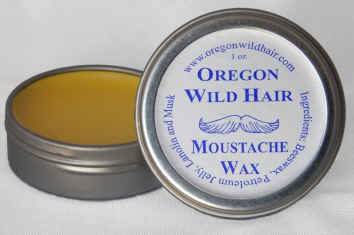 While shopping at Winn Perry recently, I made an impulse buy and picked up a tin of Oregon Wild Hair Moustache Wax. I was badly in need of some new wax for my soup-catcher, having just exhausted a tube of Clubman's. For those of you used to waxes such as Clubman's, which dries very stiff and hard, Oregon Wild Hair's product is a bit of a change. In addition to its very soothing faint aroma of honey and musk, it stays rather pliant and pleasant. It's easy to work, easy to use, and not nearly as tacky as Clubman's. I've only been using it for a few days and am still getting the hang of it, but so far I'm really feeling that it's a superior product. It claims to be far more resistant to melting in hot beverages, and not being water based, it's far less likely to dissolve while drinking a glass of beer. It's not as easy to wash out of your moustache, unfortunately, but during the day this is a really great thing, as it doesn't require frequent applications when involved in the typical daily activities of a gentleman of leisure (which we are of course too discreet to discuss). Please give it a try! The pros: Very good press, and the draw is excellent-- construction exceeds the expectation I'd have at this price point. The cons: Maybe not the finest tobacco. Light-medium in flavor, with plenty of smoke but unfortunately also some acridity early in the finish that I found unwelcome. Smoking it very slowly, especially on account of its draw, helped a lot. Nice size and shape for me. Now, here's where it gets strange. There's a suggestion of fennel, and in a bad mood I might describe that as "teasingly herbacious, but regrettably bitter". However, smoking it put me in a good mood, so I will instead say that this is one unique-tasting stick! There's a little acridity on the finish that follows a core of either Sen-Sens (although of course far more mild) or even cedar forest and hay, yet it is more appropriate to describe the flavor overall as unique, rather than leaving the impression that it is an especially complex smoke: it's just difficult to pin down. A mild hint of dark coffee wafts in now and again. Maybe it will make more sense when you try one. to buy a box. On the other hand, I can also easily imagine this being someone's very favorite cigar for the money. If you like its character, then about all you will want to ask of it is that it might burn more evenly or be prettier. Otherwise, you're probably going to be in heaven. At the price, if you try one and like it, it's likely a no-brainer. On the other hand, this could come across as somewhat dull or just plain bizarre on a different day. I am obliged to point out that the name "Magic Mountain" comes from the Thomas Mann novel of the same name, in which the Maria Mancini brand is mentioned. All I can say is "Wow". This has a very blueberry aroma. The initial taste is blueberries, followed by dark smokey oatmeal flavors, and leaving the lingering taste of, amazingly, blueberries. Just as we Americans enjoy copying and modifying various English beer styles to create new brews all our own, so do our beer-loving friends in the Lowlands. Gouden Carolus Hopsinjoor is a Belgian take on a classing English-style IPA. It is certainly a rather unique brew, pouring a cloudy yellow with a very enthusiastic, meringue-like head with herculean retentiveness. In fact, even though I was pouring into a very large goblet, the head on this beer was so thick and foamy and large that I had to pour in stages. I really did not know what to expect from this beer. American IPAs are far bolder and more heavily-hopped than their English counterparts, and frequently with very fresh, bright hop flavors. Before getting into the Hopsinjoor, I knew that Belgian beers frequently use aged hops, which mutes their flavors and relegates them to the background behind delightful combinations of other spices. I tentatively sniffed the beer, picking up some faint hop aromas and a nice, fresh scent. Then I sipped, and I sipped mostly head, because I had to get through a lot of that to get to the beer. The head was overwhelmingly bitter. Hop oils tend to be drawn out of a beer into the head, giving one a nice blast of whatever hoppiness awaits in the golden liquid below, and this head had an astounding bitter acidity that did not really bring to mind the clean, fresh hop flavor one gets from Oregon beer, for instance. There was a tartness that reminded me of the flavors I expect from hop extract beers like Pliny the Elder, but without the pleasant citrus flavors. Citrus did wait below, however. The liquid part of the beer was nice and refreshing, with tart citrus notes and yeasty esthers that overpower the malt. The carbonation had a remarkable effervescence, and overall I'd have to say that nothing in this beer reminded me of an English-style IPA. Perhaps I'm being just a little too close-minded, but this beer reminded me more of a badly-hopped Belgian golden ale than an attempt at an English classic. I am not sure I'd be very enthusiastic about trying it again.